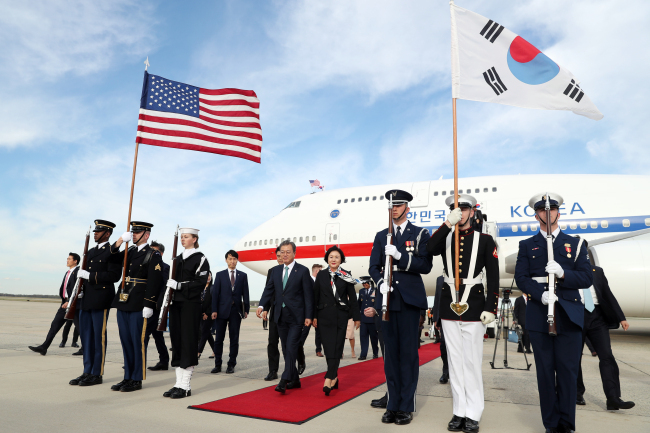 The United States has informed South Korea that it will replace a washed-out Korean national flag used in last week's airport welcoming ceremony for President Moon Jae-in, Seoul's foreign ministry said Tuesday. A US honor guard held up the Korean flag, along with an American flag, on April 10 when they lined up at the Andrews Air Force Base near Washington, DC to welcome Moon's visit for talks with US President Donald Trump. The flag caused a stir in South Korea as the blue color of the lower part of the circle pattern in the flag's center had significantly faded. Some claimed that the use of such a washed-out flag amounts to a diplomatic gaffe. "We noticed the difference at the site and explained to the US side (that it was different). They said they plan to replace it," an official from the Ministry of Foreign Affairs said.